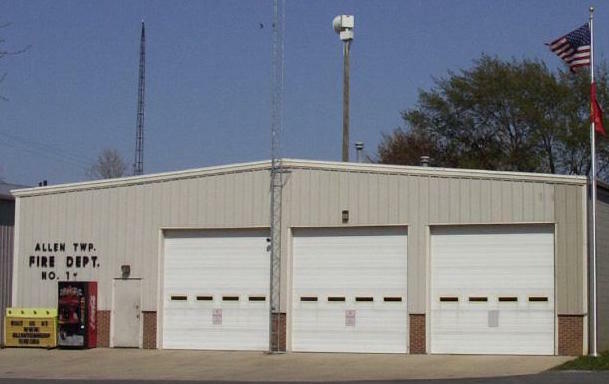 The Allen Township Fire Department Station #1 is located in the Village of Van Buren, with Station #2 located East of Van Buren on St. Rt. 613. The total area of fire and rescue response is approximately 30 square miles, which includes Allen Township, Cass Township and the Village of Van Buren. The response area of the department is bisected vertically by I-75 and also vertically and horizontally by the Norfolk and Southern Railway. The area is comprised of residential, commercial and industrial properties. These properties provide a multitude of various response situations. The origins of the fire department go back to 1871 when the need for a fire department was created as the result of a drought that plagued the area at that time. Ownership of the department was transferred from the village to the township, for funding reasons, in the late 1950’s and has remained an entity of Allen Township since then. At that time, the department had two trucks, a pumper and a tanker. A grass fire truck was added soon after along with a small equipment truck. In the years that followed, additional equipment and manpower was added and a new station was built in the mid 1970’s to accommodate the expansion. In the late 1990’s, the Township built two new buildings which included space in one of them for the further expansion of the department’s resources, providing a second station. Some of the current mobile equipment used by the department include: two pumpers, two tankers, two grass fire trucks, a heavy rescue/command post truck, two rescue boats, an air supply trailer, and an all terrain vehicle. The fire department is manned by a roster of 30 members, composed of 6 officers and 24 firefighters. The regular meetings are held the first and third Mondays of each month at station #1. Training is a must for all members and is conducted continually.